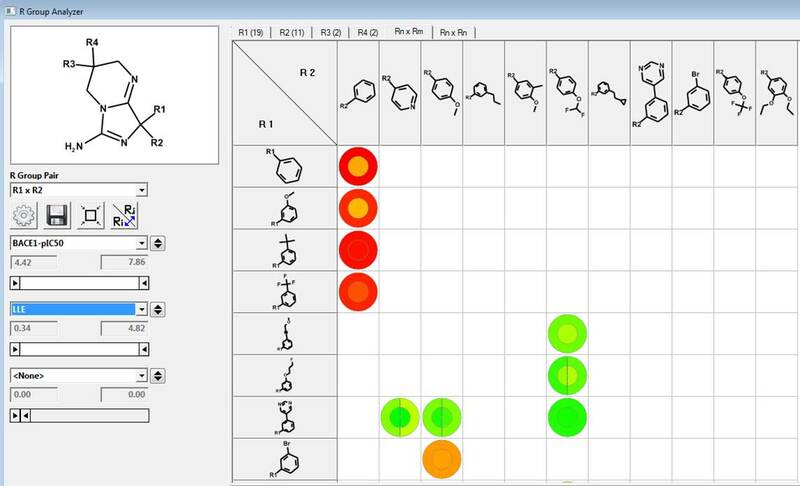 What is the MedChem Studio™ Module in ADMET Predictor®? 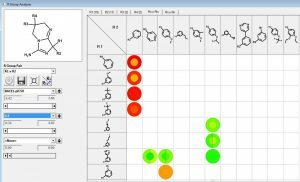 Two great programs, ADMET Predictor® and MedChem Studio™ have now been combined into one wonderful graphical user interface! 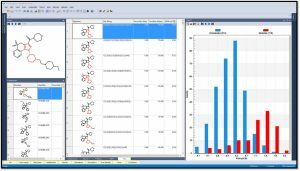 The MedChem Studio Module, described below, contains tools for data visualization, compound clustering, high throughput screening analysis, lead identification and prioritization, de novo design, scaffold hopping, lead optimization and much more! NEW! Generate fingerprints (keys) using different methods including Extended-Connectivity Fingerprints (ECFPs) in order to elucidate SAR and visualize structure alerts. One can easily identify keys that most correlate with a compound property. 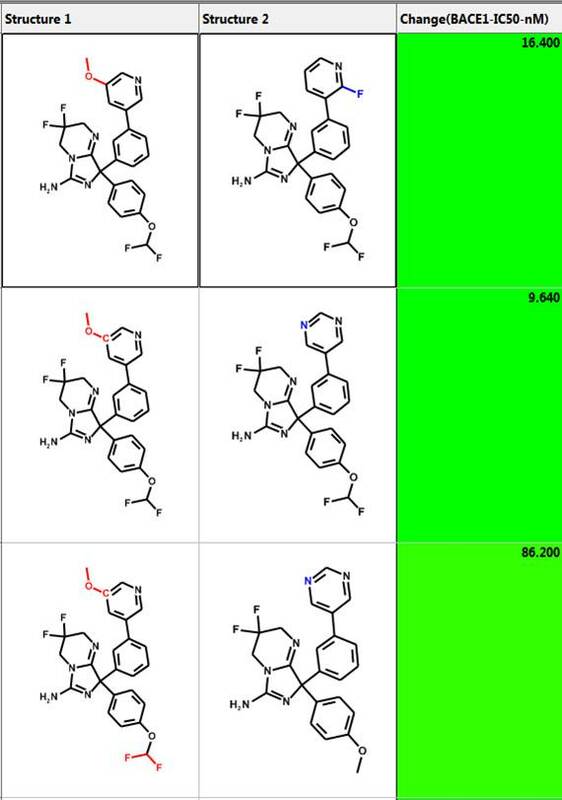 The image below shows that the 115 molecules containing the highlighted fragment have higher PI3K pIC50 values. 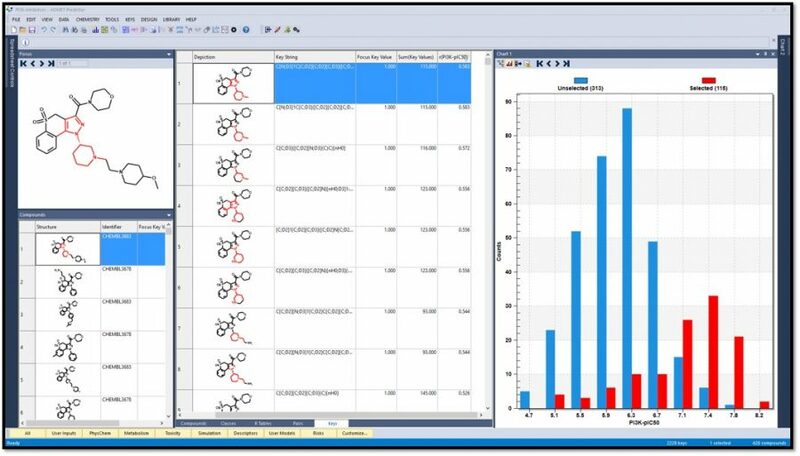 This video shows how MedChem Studio™ can be used to analyze percent inhibition data from a high-throughput screening experiment in order to identify candidates for further optimization. 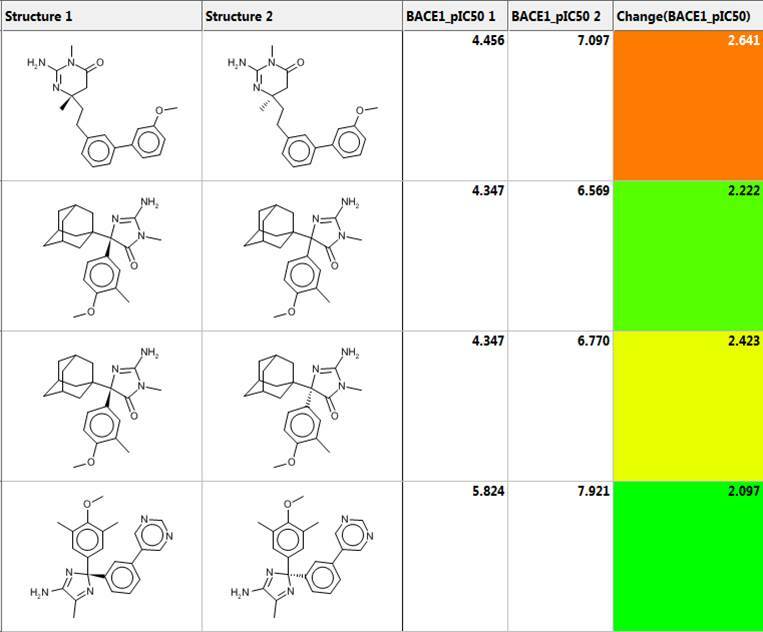 This webinar discusses details of lead hopping and de novo design with MedChem Studio™, and demonstrates the software's ability to generate new virtual structures quickly and easily. 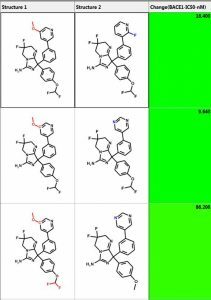 This webinar by Dr. Robert Clark describes the in silico design, synthesis, and biological testing of novel antimalarial drug candidates generated by analysis of public HTS data. 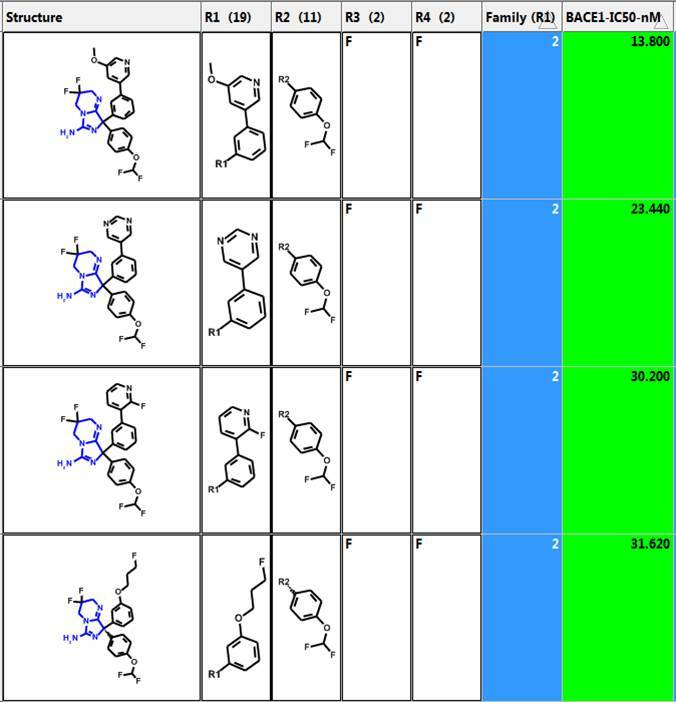 Below are the five largest classes generated using “Frameworks” on a set of 884 BACE1 inhibitors. The scaffold is highlighted in blue and the second column is the number of compounds in the class. The third column is a distribution plot of the pIC50 (-logIC50) for the compounds in each class. Let’s investigate the scaffold in the 3rd row above. One can simply click on the “R Tables” tab to automatically generate the scaffold and table below. A column is created for each R Group. The number in parenthesis is the number of substituents in each position. There is only one substituent (NH2) at the R5 position. One can define a scaffold using the lasso tool to circle (below) the atoms that define the scaffold. Now the NH2 group is part of the scaffold so there are only 4 substituents. One can create a “Family” column where all substituents are the same except for one. 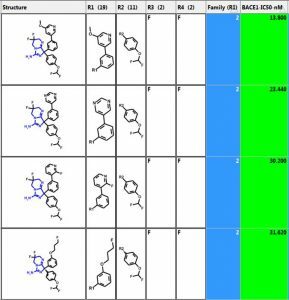 This allows one to analyze the change in activity when only a single substituent varies. 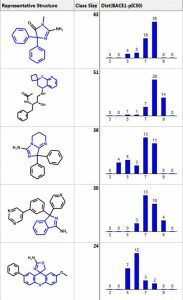 Four of the most potent compounds in family number 2 are shown below. The most potent has a BACE1 IC50 of 13.8 nM. We can investigate the R1 and R2 substituents using the R Group Analyzer shown below. Here the rows are the R1 substituents and the columns are the R2 sidechains. Empty cells in the matrix represent unexplored chemistry space. The outer circle in the “circle plots” are colored by BACE1-pIC50 and the inner circles are colored by ligand lipophilic indices. One can perform similarity searching and analyze the hits in the “Pairs” tab. The query and hit molecule are aligned by their common substructure and the differences are highlighted in red and blue. A few examples are shown below. The third column is the difference in IC50 values. One can also generate a diverse set of compounds using the MedChem Studio Module of ADMET Predictor. 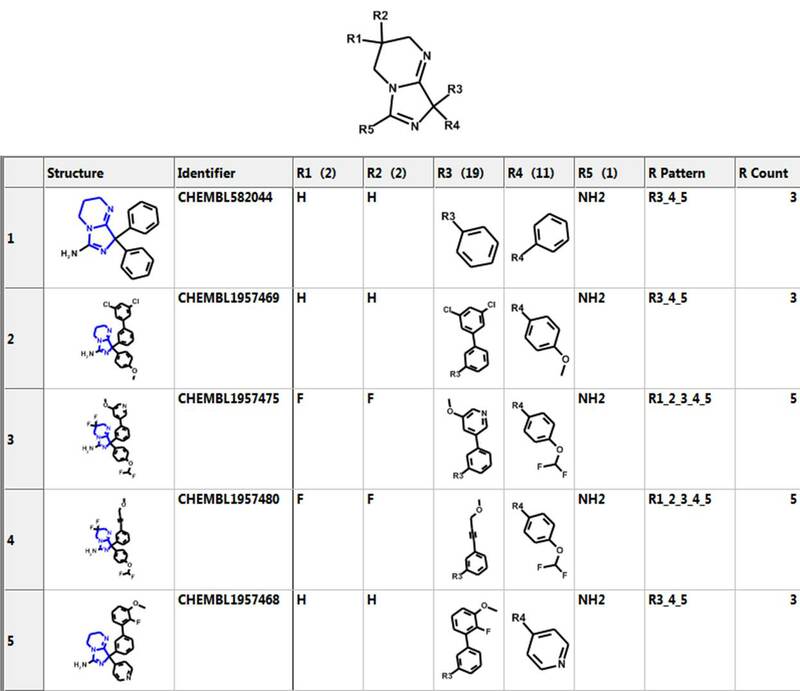 One can also create a database (library) of compounds that can be searched very quickly. The library can be screened by structure, text, or similarity. The similarity searches can be performed on a single molecule or a file of structures. 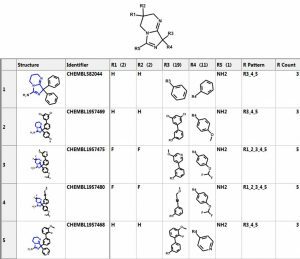 Empty cells in an R Group analysis represent unexplored chemistry space. R Table explosion combines every substituent at each position with every substituent at all other positions. However, the user can ignore substituents at certain positions so that they are not part of the enumeration. Combinatorial chemistry libraries can be enumerated by defining a reaction, mapping the atoms in the products to their corresponding atoms in the reactants , and specifying a list of reactants. The example below illustrates the reaction of nitriles with acyl hydrazines to form 1,3,4 triazoles. A few of the products are displayed on the right.